Back in the early 2000s, the rapscallion imagination of Ricky Gervais gave us one of the great TV comedies of this century, The Office. His character of David Brent, manager of the local branch of a large paper merchant, became the poster child of a latter-day comedic theatre of cruelty; engaging our pity more than anything, as a man blithely unaware (or perhaps all to aware?) of his own patheticness. Thirteen years after the series ended, Gervais has resuscitated the character for what amounts to an embellishment of one of the series' great set-pieces; the one where Brent brings his guitar to work, and regales his bemused staff with songs and stories from his time as front man of the band Foregone Conclusion. Life on the Road finds him on staff at a new office, but still dreaming of a life in music. The office scenes give rise to familiar territory, with Brent offending/annoying his colleagues with his excruciating attempts at comedy, and his unmatched ability to careen his way through the most inappropriate observations and self-revelations. Brent's not the boss anymore though, and there's more than one fellow staff member who's not shy about telling him to pull his head in. Meanwhile, 'on the road', we find Brent trying to make it with a new, younger iteration of Foregone Conclusion, with input from up-and-coming hip-hop artist Dom (Bailey Smith); cue Brent trying and failing to prove himself as blind to racial difference. The joke, of course, is that Dom and the band are talented, while Brent and his songs are terrible. There's ample opportunity to see just how terrible. There are hints of darkness though behind the laughs. We learn Brent spent time in an institution some time after the original 'documentary' aired. He is shunned by his band members, who see themselves as reluctant employees rather than friends. 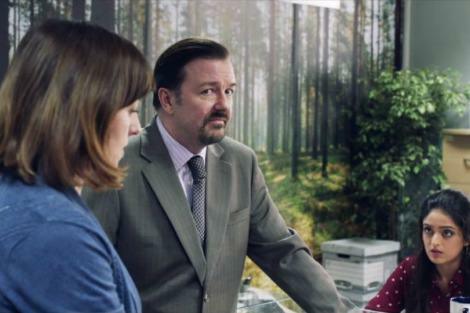 "Gervais seems to have forgotten a key tenet of what made The Office so great. Which is that it was never a show about Brent — at least, not just about Brent." What emerges is a rather affecting portrait of a man whose self-identity is at total odds with reality, and threatening to come crashing disastrously down. Of course that, essentially, is Brent's arc in The Office, too, and Life on the Road doesn't really find any new corners to the character. What's more, Gervais seems to have forgotten a key tenet of what made The Office so great. Which is that it was never a show about Brent — at least, not just about Brent. Sure, during the Christmas special finale, we cheer when he finally stands up to bully Chris Finch. But it was the conclusion to would-be office sweethearts Dawn and Tim's story that really gave our tear ducts a workout. And over the course of the series, even perennial fall guy Gareth was given enough layers to earn our sympathy, even if his behaviour, like Brent's, was deplorable at times. Minor characters like Brent's rival Neil and staffers Ricky and Malcolm were fully formed and engaging. Life on the Road, by contrast, is screaming out for a subplot, and for some of its peripheral characters to be given more colour and complexity. There are a few fringe characters — such as Brent's new office partner-in-comedy Nigel (Bennett) and sound engineer Dan (Basden) — who hint at hidden depths, but they are given short shrift. The film's emotional impact ultimately suffers for it. I put in my journal: 'a full moon tonight, crisp and splendidly clear for our walk around the shore and back to the resort' ... What did the Israeli professor remark? 'It bodes well on Hoshana Rabbah that we are casting shadows in moonlight.' Though our Chinese friend had little to say following this evening's lecture, he was right about the yellow plum at the bottom of the lake. Don't mistake this for an idyll. Incongruently, the youngest child has built a bone shrine to Pol Pot. The father oversees a rigorous physical exercise regime; later he will boast that they have the fitness levels of elite athletes. Yet during a rock climbing expedition, Ben is unsympathetic when one of them injures himself, insisting the boy draw on his personal resources to extricate himself from very real peril.